2019 Suzuki Suzuki Boulevard C90T for sale in Baltimore, MD. PETE'S CYCLE CO. INC. 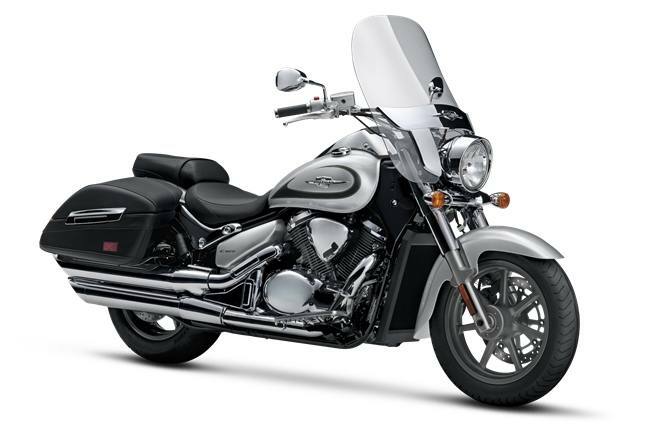 The Suzuki Boulevard C90T is a tour-ready cruiser powered by a fuel injected, 90 cubic inch, V-twin engine that delivers exceptional torque for outstanding acceleration in every gear. A strong five-speed transmission and shaft drive cleanly puts all that power to the ground. This bike also features fully integrated leather-look, rigid side cases and a comfortable passenger seat, all behind a large windscreen for remarkably comfortable cruising on the open road. With bold, classic styling, the C90T is also designed to capture attention whether you're cruising down the boulevard or kicking back at a rest stop. Bright Metallic Mystic Silver paint with new tank graphics blend well with the Boulevard's classic styling, windscreen, leather-texture seats and matching saddlebags. 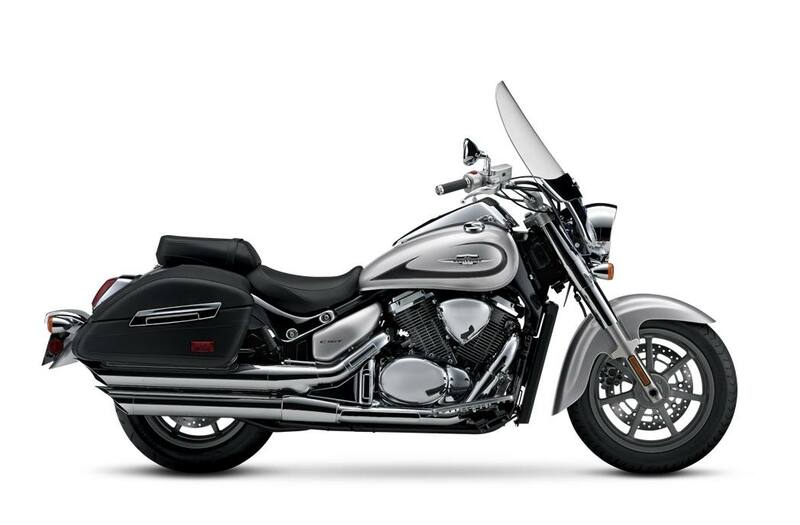 Ninety cubic inch (1462cc) 54-degree V-twin engine rumbles through dual pipes as it smoothly puts down power that's at home in town or out on the highway. Riders settle in behind a classically styled windscreen holding wide, buckhorn-style handlebars, with feet comfortably on forward-mount floorboards, while sitting on a plush seat that's just 28.3 inches above the ground. The aluminum alloy cylinders are coated with Suzuki Composite Electrochemical Material (SCEM), a coating of nickel-phosphorus-silicon carbide that reduces friction and increases heat transfer. The result is increased durability and ring seal. Each piston's upper compression ring and oil control ring are given a chrome-nitride coating to make them harder and smoother to further reduce friction. To further reduce mechanical sounds, each cylinder head's cam cover is separated from the cam bearing caps, and a rubber gasket is used between the cylinder head and the cam cover. Suzuki Dual Throttle Valve (SDTV) induction system is enhanced by the 32-bit engine control unit that instantly delivers the optimum fuel-air mixture and power output. 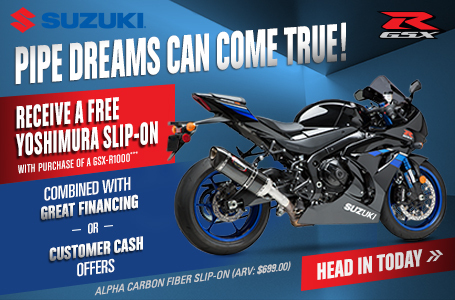 This system - it's the same design used in Suzuki championship-winning GSX-R sportbikes - delivers seamless throttle response while boosting fuel efficiency and delivering strong torque. The Suzuki Clutch Assist System (SCAS) reduces the force needed to pull in the clutch lever, so clutch operation remains light. The clutch features back-torque-limiting clutch system, contributing to smooth downshift operation. Low-maintenance shaft drive is clean-running and has minimal torque reaction, as it efficiently transmits power to the wide 16-inch rear tire. The appeal of classic styling is combined with the bene?ts of modern touring performance, with the steel-tube frame comfortably carrying the rider and con?dently housing the powerful engine. The styling incorporates timeless visual statements from cruiser heritage: rich paintwork, glittering chrome, and deep front and rear fenders with flared ends. Large-capacity, leather-texture saddlebags with Boulevard emblems are standard equipment, and convenient twist-lock fasteners provide plenty of storage capacity. These rigid saddlebags are made of durable, impact-resistant ABS plastic under stylish covers custom-matched to the leather-grain texture of the seats. They are designed as part of the bike, not as luggage add-ons. Design engineers focused on creating an ideal rider's triangle - footboards, handlebars, and seat positions set to deliver classic control with outstanding comfort. The resulting wide handlebar, seat and low fuel tank shape add true comfort to the C90T's low-slung, relaxed look. Wide passenger seat makes for comfortable two-up rides. Its stepped location on the rear fender allows passengers to see over the rider's shoulder. A beefy 16-inch rear tire and complementary 17-inch front tire have wide footprints and are mounted to bright, spoke-style wheels for a nostalgic cruiser look. The multifunction instrument includes a convenient gear-position indicator and a fuel gauge, along with a clock and a trip meter, plus indicator lights for low fuel, turn signals and more.